About 20 percent of newborns will have a blocked tear duct or lacrimal duct stenosis. 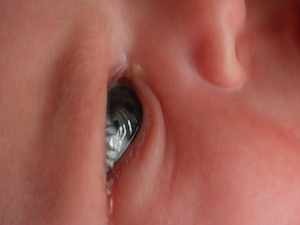 Typically, parents notice recurrent yellow eye discharge without any redness of the white of the eye. This can occur in one or both eyes. How does this happen? Tears are formed in glands superior and lateral to the eye. These tears cross and wash our eyes. Normally, they drain into the lacrimal duct which leads to the nose. In many newborns, this drainage is partially or completely blocked. As the tears well up one of two things will happen. Either the tear will run down the infants face or as water evaporates a yellow residue forms. While many doctors recommend antibiotic drops or massage of the duct, I do not recommend any treatment. Most clogged tear ducts self-resolve by 6 to 8 months. If they do not improve at 12 months, the child should be referred to a pediatric ophthalmologist.